As the whole of human history shows and storytellers have always known, stories are a wellspring of communal life. Stories inspire, support, and sustain all types of human communities. Think of the patriotic tales that stir the national soul or the traditional holiday stories recounted at family gatherings. Consider the ancestral sagas of tribes and clans or the religious narratives that unite a congregation. Having a story in common brings people together because stories cultivate the communion of hearts and minds that creates community. By playing a role in communal stories, people participate in a shared identity and engage in mutual interests. Stories provide a community with the common ground and shared vision needed to inspire collective striving. The Storytelling in Organizations SIG brings these narrative insights onto the contemporary business scene by documenting and promoting the constructive role and widespread importance of storytelling in corporate, non-profit, small business, education, and other settings. 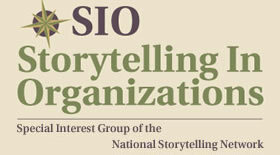 Further, by clarifying the dynamic, integral relationship between narrative and organizational development, the SIO SIG advances the role of storytellers as workplace consultants. Organizational stories provide an effective way to convey fundamental understandings necessary to workplace design and culture. The specific kind of knowledge that stories communicate is crucial. While information can be said to be the lifeblood of every organization, information alone is never enough. Crucial to success are stories that speak to the heart of why information matters. Stories supply facts with meaning, and value propositions with illustrations; they testify to core beliefs and kindle aspirations that motivate and enhance performance. As a uniquely human mode of communication, stories surpass information processing in creating and developing vital relationships. Organizational stories set the stage for cooperative and productive work relationships by creating common contexts of knowledge, interest, and communication. The dramatic effect of workplace storytelling makes clear that organizations are not information systems. Work organizations are really social structures more akin to communities like families, tribes, and teams than to input/output models like computers. Storytelling opens paths of organizational development that promote and sustain the productive human factors deadened and dulled when workplaces are organized and operated as if they were machines. An organization’s stories provide the foundation for building an energized and disciplined work community that fosters the initiative, cooperation, creativity, and satisfaction of work at its best. Storytelling reminds us of what matters and connects us with a sense of meaning and purpose in our endeavors. The multiple activities of the SIO SIG membership bear specific witness to the distinctive power and value of stories in organizational life.